This unique locomotive was the Chapter’s first acquisition, coming to Pomona in 1954. It was donated by Sunkist Growers, Inc. and its subsidiary, Fruit Growers Supply Company. 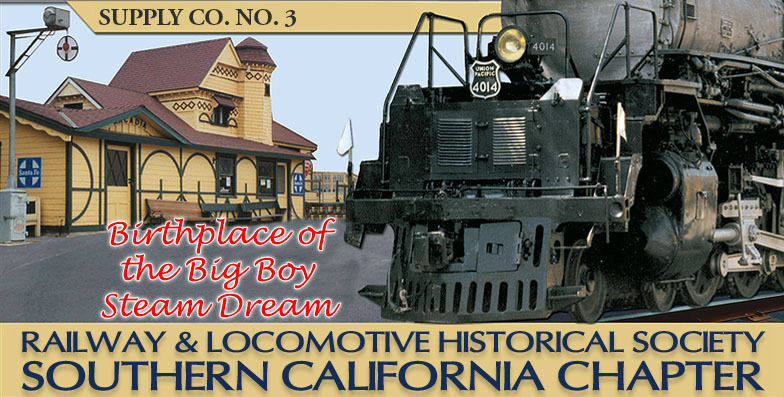 Number 3 is a Climax type, geared locomotive and was used on Fruit Growers’ logging railroad at Hilt, California. This breed of locomotive was once popular, along with the more widely used Shay and Heisler, on the tortuous, rugged logging railroads of our country. Sunkist entered into Logging to insure a steady supply of "shook" (pronounced shuk) wood for orange crates. All six axles on the locomotive are powered, through a series of gears and flexible shafts primarily driven by the two inclined cylinders on each side. Compared to the conventional rod locomotive the flexibility of the Climax made it ideally suited for the rough terrain of the logging railroad. Sunkist’s formation in the late 19th century was a function of the burgeoning growth recorded by California’s citrus industry during the period. Commercial citrus production began in the region roughly a half-century before the birth of Sunkist, when the first commercial orchard took root in 1840. From this starting point, a series of events fanned the fires of growth, transforming that single orchard situated in what would later become downtown Los Angeles into a thriving industry and an integral component of the state’s economy. The forces that promoted the growth of the citrus industry provided the reason for Sunkist’s creation. The first significant event occurred in 1848, when the beginning of California’s Gold Rush lured prodigious waves of fortune seekers into the region. As the state’s population increased exponentially, its ability to meet the food demands of its new residents was stretched beyond capacity. Vitamin-rich fruits and vegetables were in short supply, causing many of the new Californians to develop scurvy. Citrus production was increased as a response, but an even greater boost to the fledgling citrus industry occurred 20 years later when the transcontinental railroad was completed in 1870. Within ten years of the first rail shipment, the volume of California citrus moving east had grown to more than 2,000 rail cars annually. In another five years the volume had doubled. California citrus had become big business.